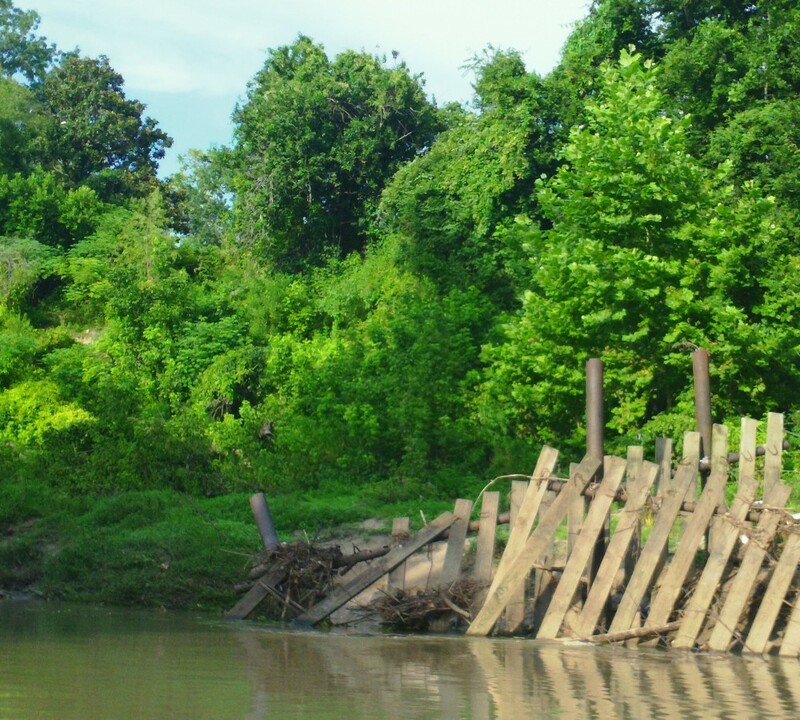 When the bayou’s banks slump or collapse, the brush and fallen trees left in place collect sediment during subsequent high waters, gradually rebuilding naturally reinforced banks. These new nature-built banks are better able to withstand subsequent floods as well as the more powerful flows being released from the dams upstream as a result of increasingly intense rains on a landscape increasingly covered with impervious surface. 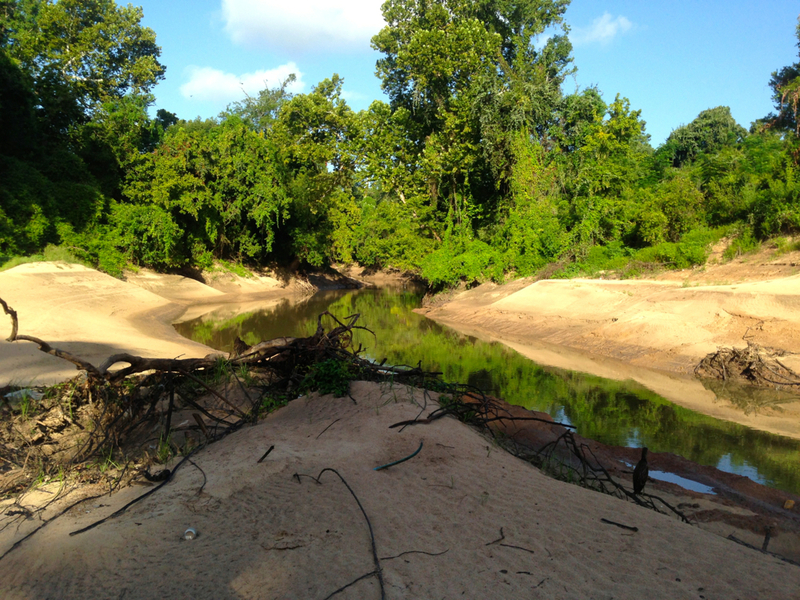 Amazingly, the bayou itself then reseeds these and other sandy areas with the proper succession of plants that first colonize then stabilize the sediment, turning sand into soil, preparing the way for seedlings of trees. It’s part of the natural function of riverine flooding that we rarely have opportunity to observe, especially in the middle of a city where we have dug up and covered in concrete most of our bayous and streams. Having built in the way of flooding and even increased flooding by cutting down trees and paving over prairies, most of us have little understanding or sympathy for the way rivers and wetlands work. These miraculous riparian plants and trees, forming a type of wetland, not only absorb and deflect rainwater during storms but also naturally filter and cleanse the water flowing in the stream as well as the runoff heated and polluted by our hot, filthy pavement and fertilized yards. Riparian vegetation can be more effective at treating sewage than costly treatment facilities. 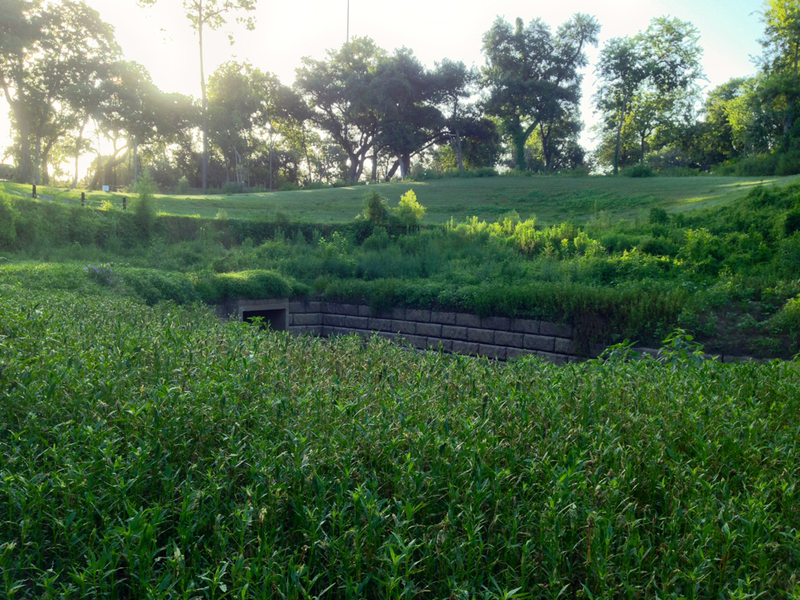 Natural, green systems provide better defenses for flooding. Yes, this wonder of nature happens even on our urban bayous. Here is a slideshow of photographs of the south bank of the Hogg Bird Sanctuary that collapsed during the Memorial Day 2015 flood and is now naturally stabilized and blooming with new growth. You can try this at home, if your home happens to be on the bank of a bayou or creek and you haven’t already cut down all your trees and removed the native vegetation for landscaping, which is something you should not do if you want to protect your land from erosion. Keep in mind, though, that some erosion on a river is natural. We haven’t had a chance to see for ourselves, but we know that many trees fell in the residential areas upstream. 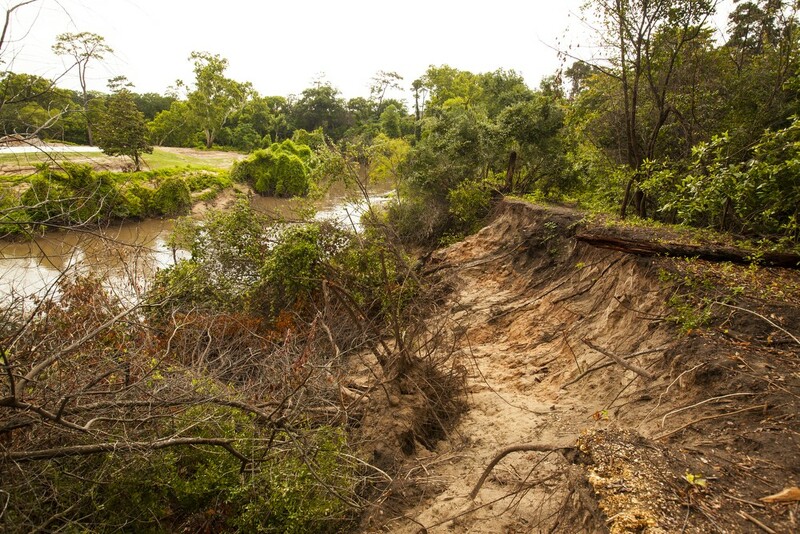 Landowners, as well as the public owners of our parks, saw extensive bank slumping and erosion due to the record high flows that lasted for months in Buffalo Bayou. But on the banks the brush, as noted above, serves a practical purpose. 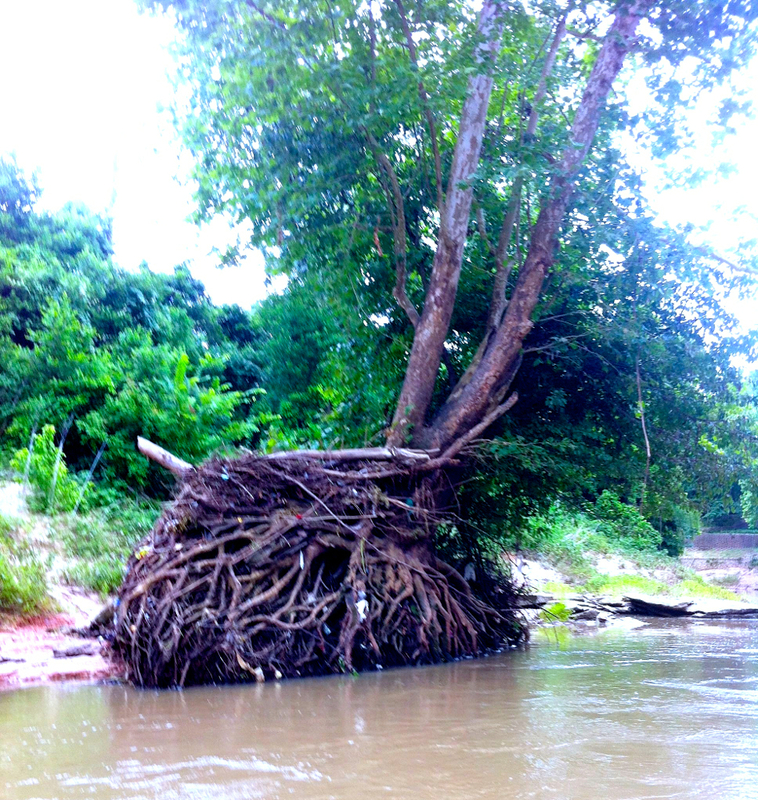 If you don’t have trees or brush lying on your banks, you can create a “brush mattress,” mimicking nature, by dragging brush there, preferably live willow or box elder branches or other native trees and bushes that naturally grow on the bayou, layering it, tying it together, and pinning it to the banks, if necessary. And wait, patiently. We put in at the Texas Parks and Wildlife boat launch in Memorial Park at Woodway, just west of Loop 610, in an area known as the Old Archery Range. Boy Scout Saswat Pati had not yet installed the wooden boxes he had built to distribute reusable mesh bags for paddlers to collect trash on the bayou. 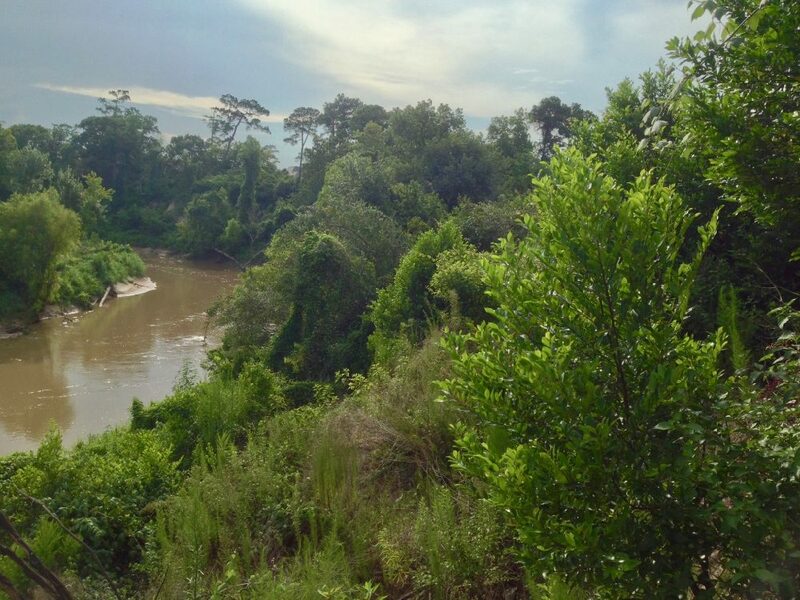 The bayou, flowing so high and fast for so long, had disguised the huge, ugly concrete Redi-Rock stormwater outfall with high mounds of sediment and new native plants. 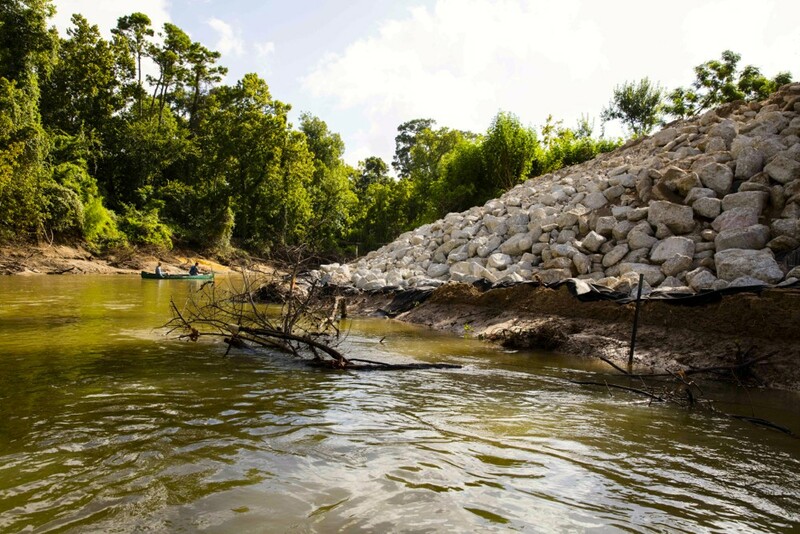 The drainage outfall was gashed out of the forest there more than two years ago by the Galleria-area Uptown Tax Increment Reinvestment Zone (TIRZ) to drain Post Oak Road. Sediment collects around the outfall because of its poor design. Stormwater shooting from the outfall blocks the flow of the bayou and creates an eddy that washes sediment up onto the bank. However, it was pleasing to see how nicely the bayou was once again stabilizing and landscaping the new sediment with native plants. Thankfully, these important riparian plants have been allowed to grow. Smartweed and other native plants growing naturally around the Woodway drainage outfall/boat launch. Mowed Bermudagrass above. Photo Aug. 4, 2016. It was less pleasing to see that the Memorial Park Conservancy continues to waste money mowing the non-native Bermudagrass planted by the TIRZ farther up the bank where trees had been cut down. Mowing grass shortens its roots, and tall grass with long roots provides better erosion control. This is true even with the noxious Bermudagrass, though it would be far preferable to have native grasses on this slope. 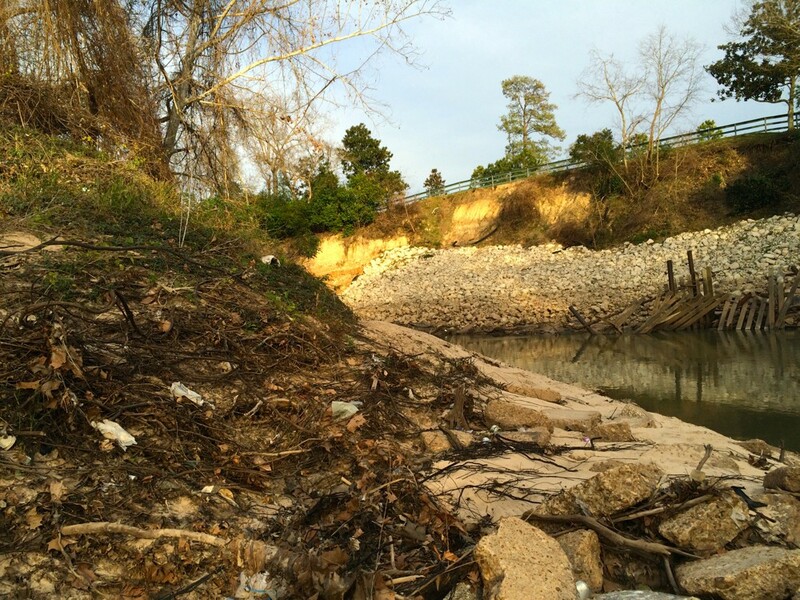 The $1.58 million outfall/drainage and landscaping project, which removed a large number of trees in what was once a nature area, was described as an “erosion control” project. Trees and their roots, leaves, and branches are also important for erosion control, as noted above. It’s puzzling to contemplate the logic of planting non-native Bermudagrass on the slope and retaining walls of the outfall/boat launch while removing invasive, non-native trees and plants in the adjacent woods. According to Shellye Arnold, executive director of the conservancy, the work in the woods is part of an “ecological conversion” project in the park paid for in part with $1 million in taxpayer funds annually through the Uptown TIRZ, which also paid to plant the difficult-to-remove Bermudagrass next to the woods. 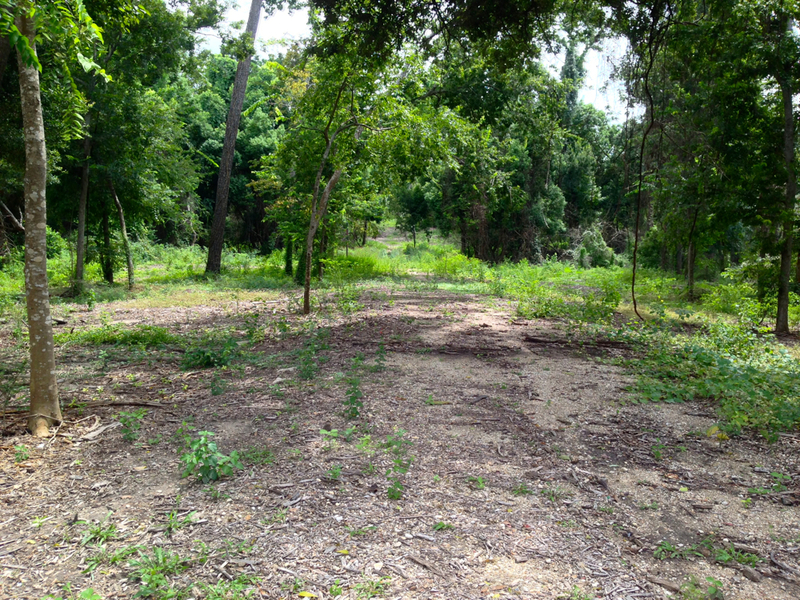 The woods undergoing ecological restoration in the Old Archery Range of Memorial Park at Woodway west of Loop 610. Photo Aug. 20, 2016. The ecological work also involves the removal of some hazardous trees, though other dead trees have been left in place, as a forest ecosystem requires dead trees for wildlife habitat, said Arnold. Small signs warn that the woods are closed to the public due to hazardous conditions, which seems perhaps excessive, as much of the park’s woods, indeed most woods, where limbs and even entire trees fall, are similarly hazardous. Even yard and sidewalk trees do this. Still, it’s best that people be warned of the hazard. Though perhaps it would be useful to say what the hazard is. Dragging our canoes, we climbed over the high dunes of sculpted sandy mud that have buried the outfall’s useless concrete maintenance ramp. We dropped the boats into the water and commenced paddling. Or rather Tom Helm commenced paddling, as he usually does most of that. The flow was base flow that day, a very slow current, about 120 cubic feet per second, and the water was so low we soon scraped bottom a number of times. But it was cool on the water, and shady under the overhanging trees. We drifted downstream with the natural banks of the Arboretum and Memorial Park on our left, clear water seeping through layers of red clay. On our right were numerous unpermitted, private erosion control projects, ugly piles of concrete chunks dumped into the water, metal retaining walls, attempting to hold back landscaped gardens, houses, and high-rise parking lots built too close to the water. Legions of silver-winged damselflies accompanied us downriver, lighting on our cameras and wooden paddles, as we noted the changes in the high banks and bends, the newly revealed outcroppings of ancient sandstone, and maneuvered around trees that had fallen, including a favorite sycamore that had long been leaning over the water, clinging to the sandstone with its intricate mass of roots. It was evident that a powerful force had moved through the bayou channel, carrying and shifting tons of sediment from one side of the river to the other. We looked for signs of beaver and turtles, concerned that the high flows might have washed out turtles and their eggs and also might have flooded the beaver lodges burrowed into the bank from beneath the water, forcing out the beaver. 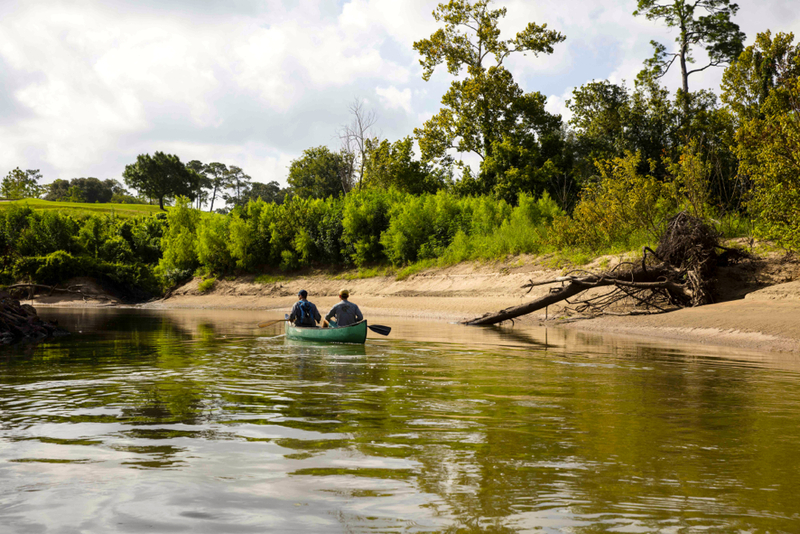 Naturalist/environmental attorney Bruce Bodson, who floats the bayou frequently, as does Tom Helm, had reported that he had “noticed a really sharp decline in the number of turtles” from what he normally saw when paddling the bayou. “I was seeing on the order of thirty to forty turtles a trip from Woodway to Sabine, and I am now seeing more like five to ten,” he wrote in an email. We did see a few turtles, but not a lot of turtle tracks. We soon came upon a major shift in the channel. A young heron was standing there, waiting to have its picture taken. The bayou had decided to cut through the point of a bend where a large cottonwood on public parkland on the north bank had fallen during the Memorial Day 2015 flooding. [Corrected Sept. 11, 2016. Story previously said property owners on south bank had cut down trees.] 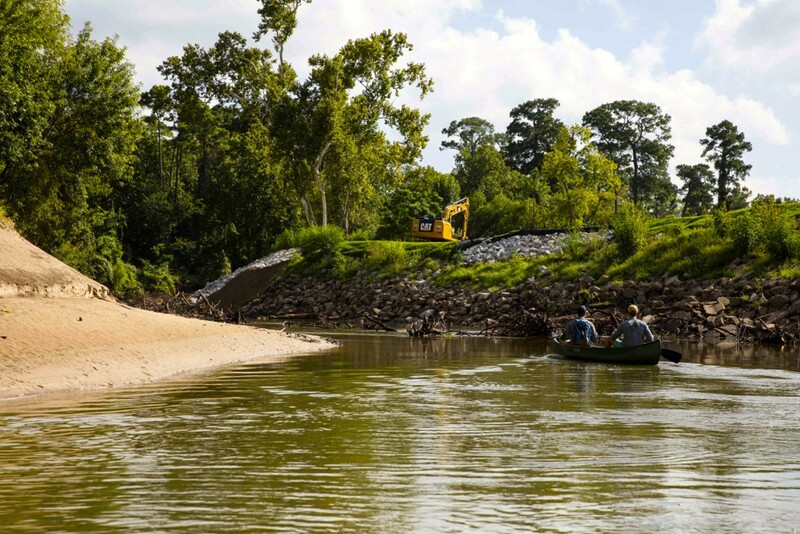 During the high flows the bayou, running up against the stone and metal-reinforced bank on the residential south side, had deposited a massive amount of sediment, almost filling in the bend, and slicing through the point of the north bank. The tree stumps were now on the south side of the channel. Further on we came to the sharp left bend that marks the beginning of the River Oaks Country Club golf course and the beginning of the stretch of the river proposed by the Harris County Flood Control District for the destructive Memorial Park Demonstration Project. This is the project that we oppose. Here the club, which was to be a one-third partner in the long-delayed project, has dug up and removed the vegetation growing on a terrace under the high south bank and hard armored the bank with ugly concrete riprap. The Corps has so far wisely not decided to issue a permit for the project, though we keep hearing rumors that this is going to happen soon, next month, any day. The controversial and destructive demonstration project was meant to demonstrate “natural channel design” methods for bank stabilization and restoration. Unfortunately, in this stretch of the river, “natural channel design” would have razed shading trees and vegetation and bulldozed the banks, breaking up the healthy organisms in the soil, destroying healthy, functioning riparian forest and wildlife habitat. 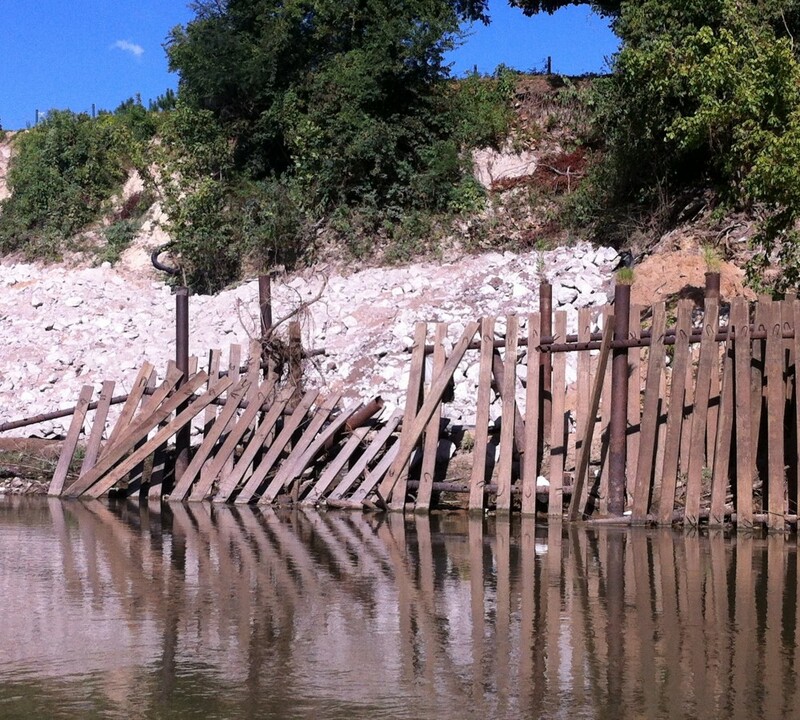 This was demonstrating to landowners exactly the wrong thing to do for erosion control. It also violates federal and state policy and regulations for the preservation of riparian areas, so vital for the health of our water. The project, initiated by the Bayou Preservation Association in 2010, would do nothing to help with flooding. It is not a project to widen the bayou channel or increase the volume of water running through it. It would likely increase the velocity and erosive force of the water running through a deeper, narrower, shorter, denuded channel, causing greater damage downstream, including in Buffalo Bayou Park east of Shepherd, where the banks engineered by Flood Control using “natural stable channel design” are constantly sliding away, requiring constant costly repair. And the Memorial Park project would likely fail, as have many similar projects across the country as well as here at home. In this case failure would in large part be due to the bayou’s slippery geology, as described above. And did we mention that the “restored” banks, unlike the natural banks, would require repeated maintenance and repair at taxpayer expense? So we were floating at base flow, no recent rain, scraping bottom. The water level hardly gets any lower than that. Yet one can see (in the slide show of photos below) that the riprap here (and further downstream) comes down nearly to the water’s edge. Notice also the mud stain about half way up the riprap. What does that mean? It does not mean the water’s edge at lowest possible flow. The Clean Water Act is meant to protect the cleanliness of our water in a navigable stream and in its tributaries, all of which flow into our bays and oceans. As mentioned above, riparian areas and wetlands are vital for the health of our water, as well as for controlling flooding. So you’re not supposed to dump anything or dig up or build anything below the OHWM (or in an adjacent wetland) without a permit from the Army Corps of Engineers, which is responsible for enforcing the Clean Water Act. We have studied the engineering drawings outlining the OHWM in this stretch of the river submitted by the flood control district with its 2014 permit application to the Corps. 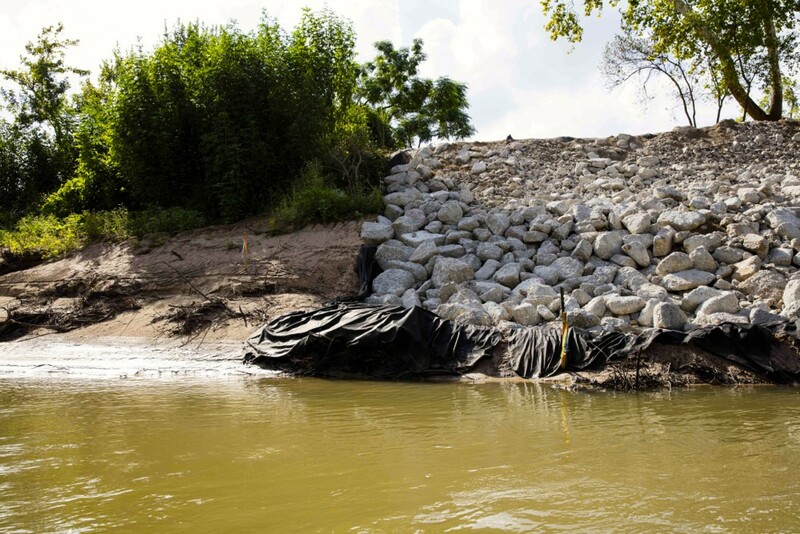 We have studied the 2015 engineering drawings of the proposed riprap installation submitted by the River Oaks Country Club to the flood control district. The district told the club that no federal permit was needed. Yet it is clear that the riprap has been placed below the OHWM both upstream and downstream. Upstream limit of golf course and project area, July 14, 2014. Note trees and vegetation growing on bench below high bank. Same upstream location covered with concrete riprap on August 9, 2015. View of upstream riprap from Memorial Park bank showing Ordinary High Water Mark. Note staining in rubble, debris line and change in soil on bank. Photo Jan. 2016, by Bill Heins. Another photo taken the same day showing the Ordinary High Water Mark, the brown stain on the new white rubble. Same riprap on Aug. 4, 2016, at base flow. Photo by Jim Olive. Last fall we complained about this. And Mathias Kondolf of the University of California, Berkeley, one of the world’s leading river experts, wrote a letter to the commander of the Corps’ Galveston District, observing that in his opinion the club’s concrete rubble appeared in photographs to have been installed in federal waters. The Corps sent out someone to inspect, and Commander Richard Pannell, since retired, politely wrote back to Dr. Kondolf that the inspection revealed that the riprap was not in federal waters. So we sent out our own expert, an experienced geologist, who waded into the middle of the stream with his dog, took photos, looked up and down, and analyzed the elevation and evidence of “the natural line impressed on the bank, shelving, changes in the character of soil, destruction of terrestrial vegetation, the presence of litter and debris,” etc. 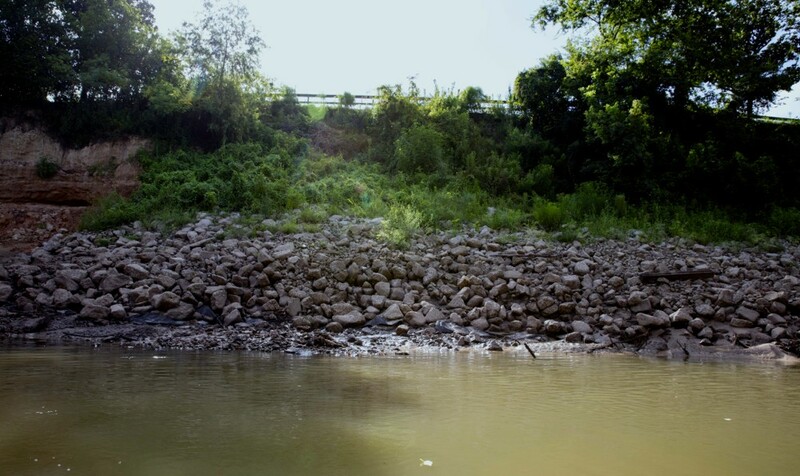 The evidence showed that the nearly one-third to one-half of the vertical extent of the riprap had been installed below the OHWM in both locations. In late February we sent a registered letter outlining our evidence to Commander Pannell. He did not respond. We sent a copy of the letter to the country club along with a Texas Riparian Association booklet on managing and protecting riparian areas. The club did not respond. And obviously it made no difference in their riprap plans. 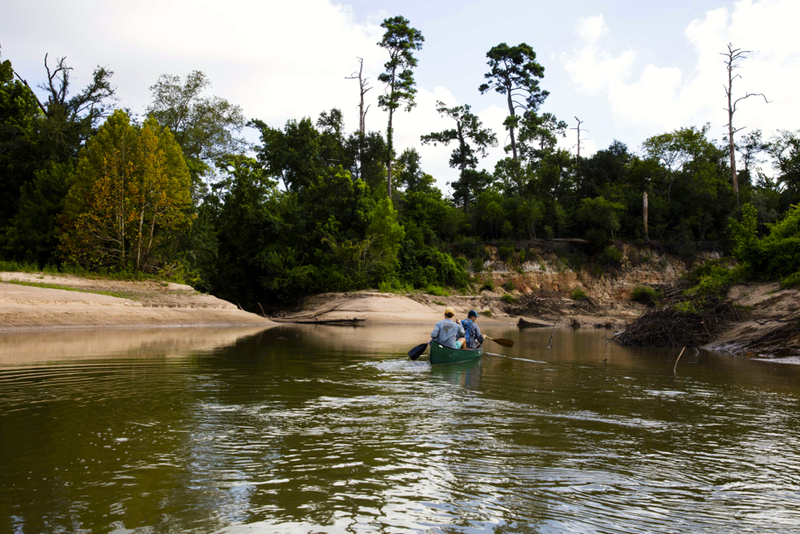 We continued paddling through a sharp bend that we call the Middle Meander of the project area. It’s a lovely wild spot at the eastern edge of the park, a natural stormwater detention area on the park side, with clean sandy banks on both sides, a tributary and high cliffs with tall trees, some of them proud pines killed by drought years ago but still standing. It’s an area favored by beavers, hawks, herons, egrets, and all sorts of wildlife. 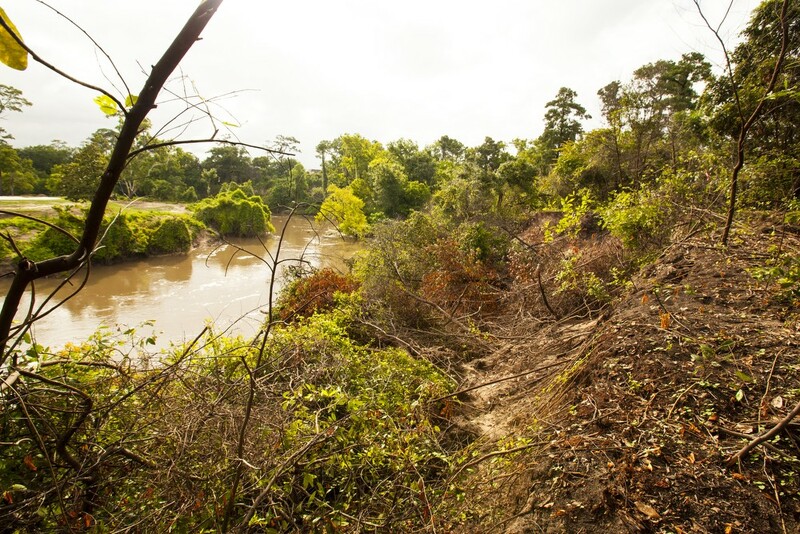 This natural detention area would be bulldozed and filled in by the Demonstration Project, the ancient cliffs, part of the region’s Meander Belt Ridges, obliterated, the sandy banks leveled, the bayou shortened, straightened, and rerouted further south. The sandy banks had changed shape, with the beach on the north side expanding. The area below the cliff is littered with tall trees that have fallen over a period of decades and remained in place, but we did not see that any new trees had fallen. Continuing round the bend we paddled through a stretch that was known for beaver activity but we could not see any sign. Round the next bend we came upon the new riprap that had just been installed days before by the country club at the edge of the golf course. It too had been placed down to the water’s edge. The bank, once heavily forested, was denuded, covered in a carpet of grass. 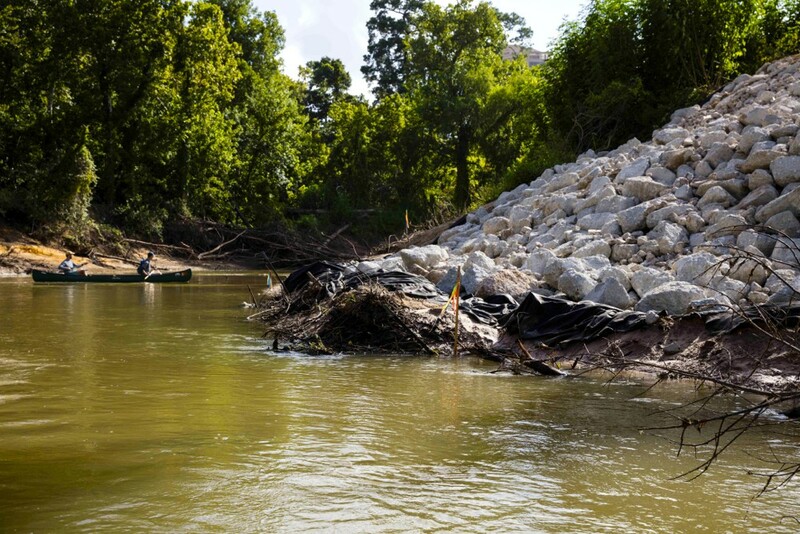 Approaching downstream riprap installed in 2015 opposite Hogg Bird Sanctuary with view of new riprap being installed. Photo Aug. 4, 2016, by Jim Olive. New downstream riprap installed just days earlier at low water's edge. Photo Aug. 4, 2016, by Jim Olive. 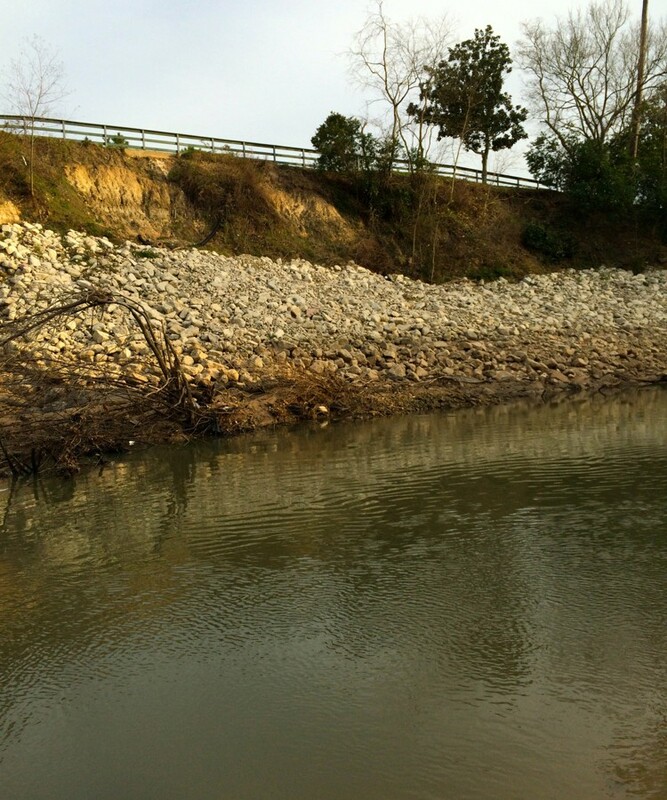 A closer view of the downstream riprap recently installed. Photo Aug. 4, 2016, by Jim Olive. Downstream border between same recently installed riprap and natural bank showing rubble below flag at impression line in bank and below changes in vegetation. Photo Aug. 4, 2016, by Jim Olive. 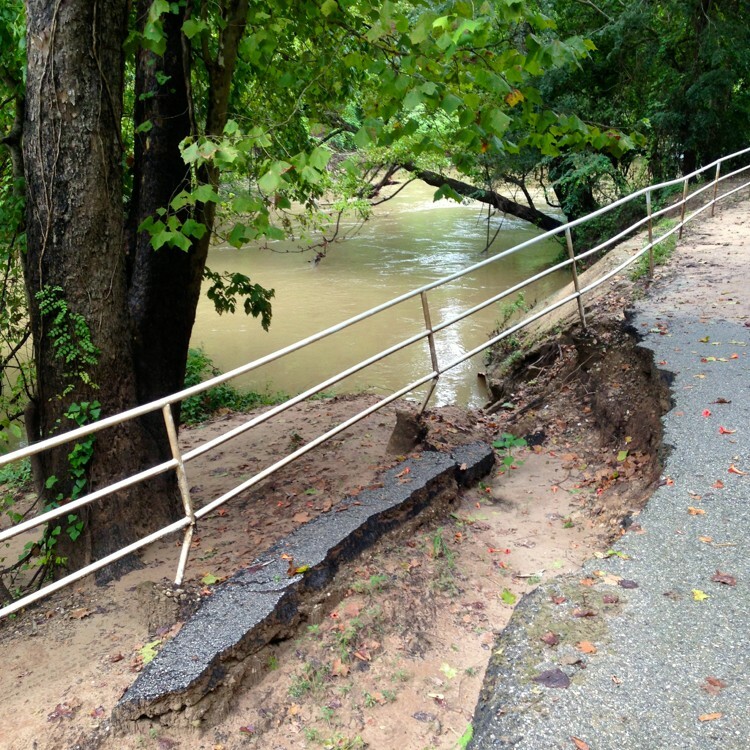 Repairs to Terry Hershey Park: Should the Sidewalks Be Moved Instead? Days later two of us loaded our bikes with some difficulty into the car and drove out to Terry Hershey Park to inspect the damage to the trails. Unlike the bayou flowing past Memorial Park, which has never been channelized, the 6.2 mile stretch of the bayou flowing through Terry Hershey Park was stripped of trees, dredged, widened and straightened by the Army Corps of Engineers in the late 1940s during construction of Addicks and Barker dams. The bayou there has since replanted itself. 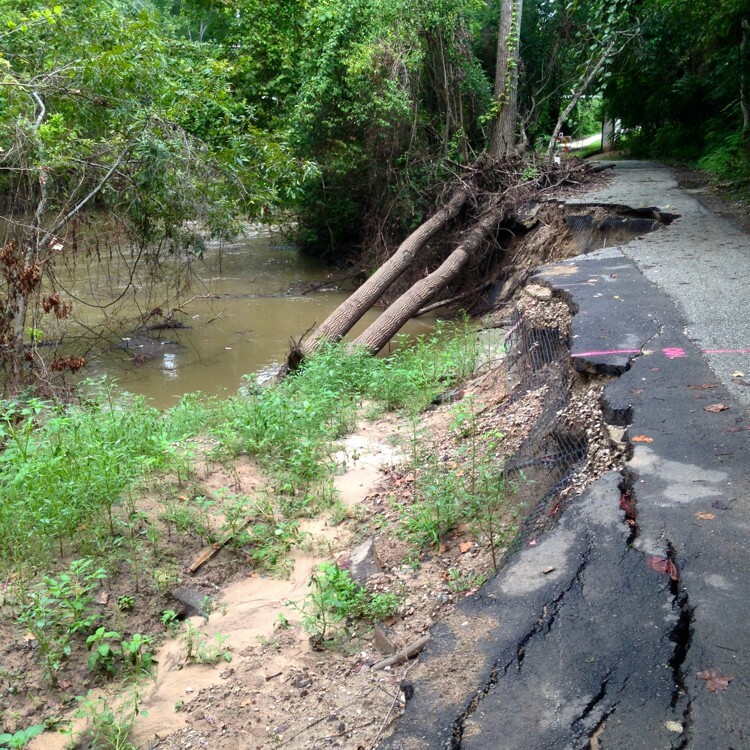 But high waters have washed out some of the trails and asphalt sidewalks on the north and south sides of the bayou in the park. And the flood control district has announced plans to repair the banks and sidewalks on the north side. The repairs reportedly will cost $600,000. The damaged trail on the north side was closed, but we rode around the barricades. We wanted to see whether there was room to move the sidewalks farther away from the water. It seems to us that repairing sidewalks so close to the water’s edge is a waste of public funds. The bayou will continue to wash out the banks. The river is attempting to adjust to the high flows. And indeed there is room to move the sidewalks farther away from the water. 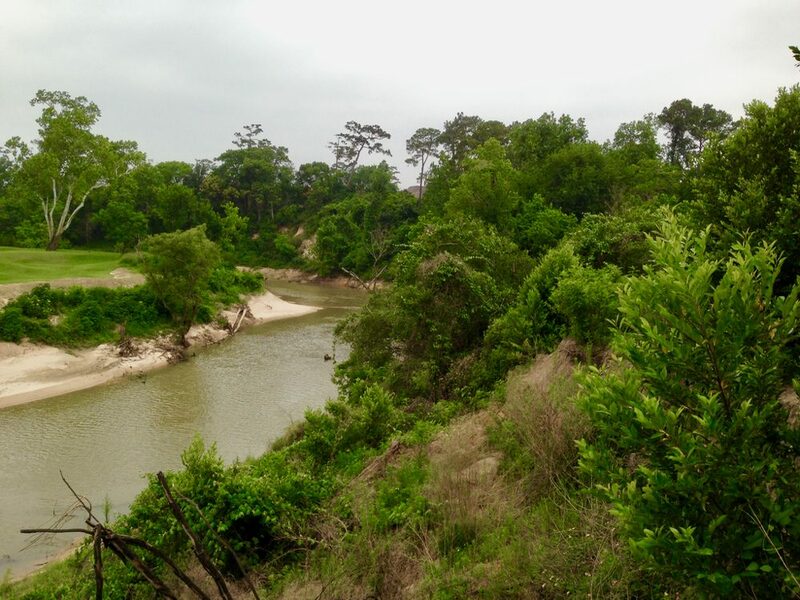 In fact, there are existing adjacent trails slightly upland that could easily be connected, trails that still have views of the bayou. Let the bayou adjust and rebuild its own the banks. Bringing in heavy equipment, digging up the banks, will only undermine them further. And continue to cost the taxpayers money. The same is true in Buffalo Bayou Park downstream. It’s time to reconsider the constant costly repairs of sidewalks installed too close to the bayou. We can have the same lovely experience of biking, jogging, and walking along the bayou without having to be so close to the water, where in any case the banks look forever distressed. Let the bayou be. Move the sidewalks instead. 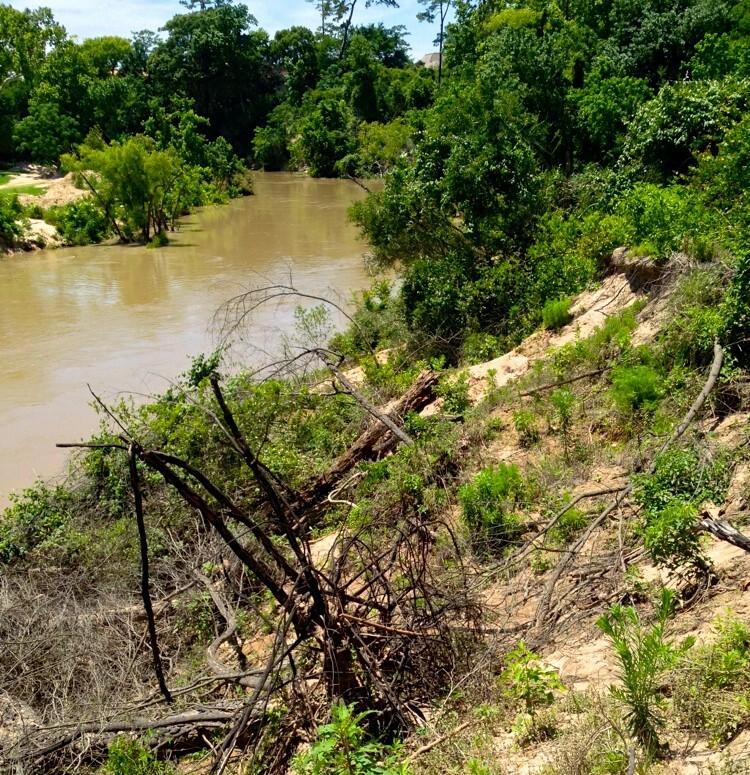 Washed-out trail immediately adjacent to Buffalo Bayou further upstream in Terry Hershey Park. Aug. 19. 2016. 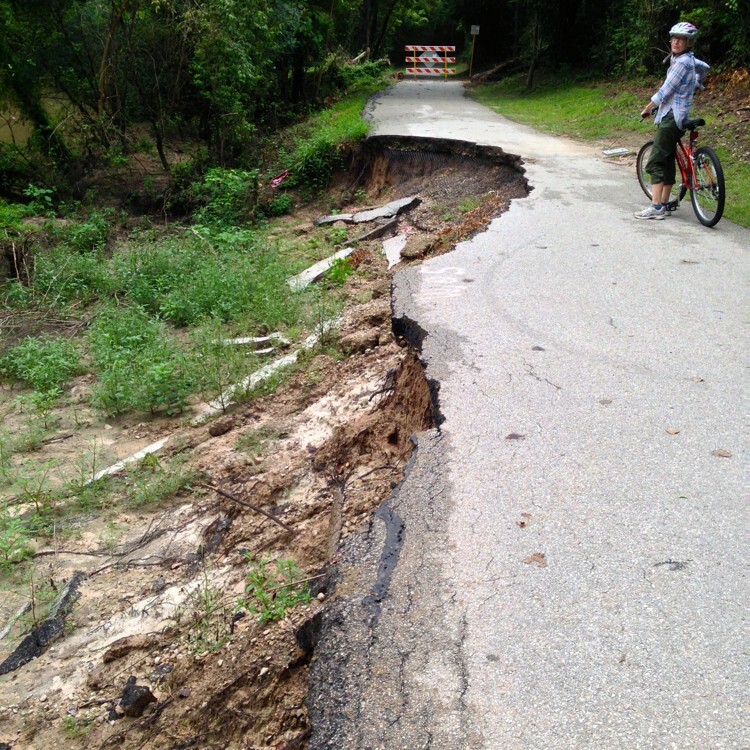 Washed out trail that should be moved away from edge of Buffalo Bayou in Terry Hershey Park. Photo Aug. 19, 2016. A fascinating report, with great photos, that hopefully makes people think. Thank you! We thought about it a lot. Couldn’t agree more about not wasting more money on sidewalks and trails that were built in the wrong place to begin with. Same issue I see every time they build more sidewalks next to bayous within Barker or Addicks Reservoir that are guaranteed to flood and be covered by debris on a constant basis. There seems to be a decision in recent years by various groups that every bayou needs a paved sidewalk built next to it with no consideration of what happens when it rains or to the constant death of wildlife on those sidewalks. I definitely think that trails without worry about automobile traffic are an excellent thing to have but accomplishing this by building them next to bayous is stupid. More planning needs to be done in the initial phases of building communities, roads, etc for trail construction rather than just shoving them next to bayous years later. What else can I say, but let the bayou do what it is natural for it to do? Wasteful expenditure of taxpayer’s money will not solve the problem. Thanks for all the work you are doing to keep nature on the right track. River Oaks Country Club should be ashamed of itself. Please use your influence to get the Chronicle editors to give them a Thumbs Down, And that asinine Memorial Park Demonstration Project! And keep those Thumbs Down coming until they quit messing with our Bayou. 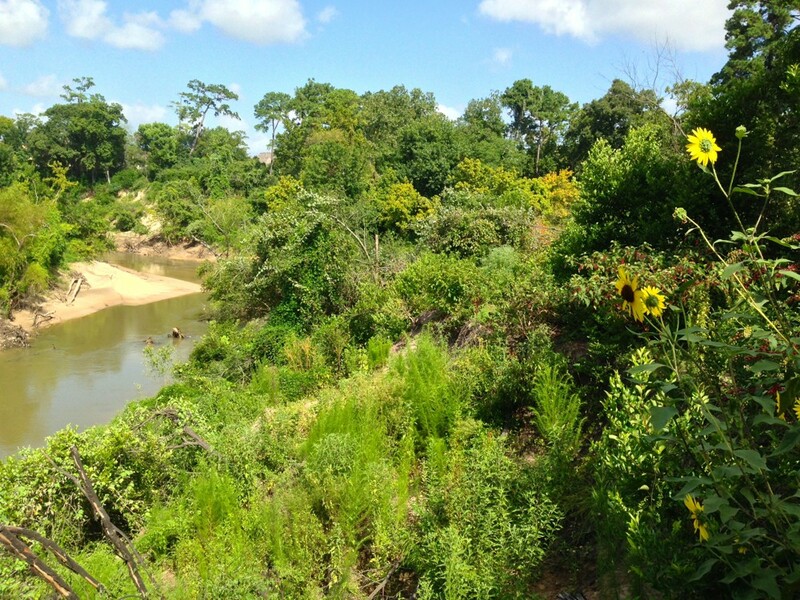 Wonderful article, thank you Susan Chadwick/Save Buffalo Bayou. I agree with all the comments. Keep up the good work, the bayou could be so beautiful & something we would all be proud of in Houston.